I created this card as a sample for the video tutorial for the Kissing technique. I started by inking the solid stamp from Verve’s Great Friend set in Cantaloupe Memento ink and Unity’s Giving it All Meaning Background stamp in Rhubarb Stalk Memento Ink. Next the solid stamp was pressed to the background stamp and then stamped on Neenah Solar White cardstock. Stems were stamped in Bamboo Leaves Memento Ink. Both the flowers and branches were cut out. A sentiment from Great Friend was stamped in Tuxedo Black Memento Ink on a piece of Solar White cardstock, that had been cut and embossed with a Classic Oval Nestabilities die. The oval was first layered on Kraft cardstock, cut and embossed with the second largest Floral Oval Nestabilities die, then on a piece of white cardstock that had been cut and embossed with a Lattice Motif die. Two pieces of My Mind’s Eye Lost & Found Two Rosy Patterned paper were cut and embossed with a Grand Rectangle Nestabilities die. The edges were sanded and stitched before May Arts ribbon was tied around the layers. The sentiment panel and flower were adhered over it with dimensional adhesive. 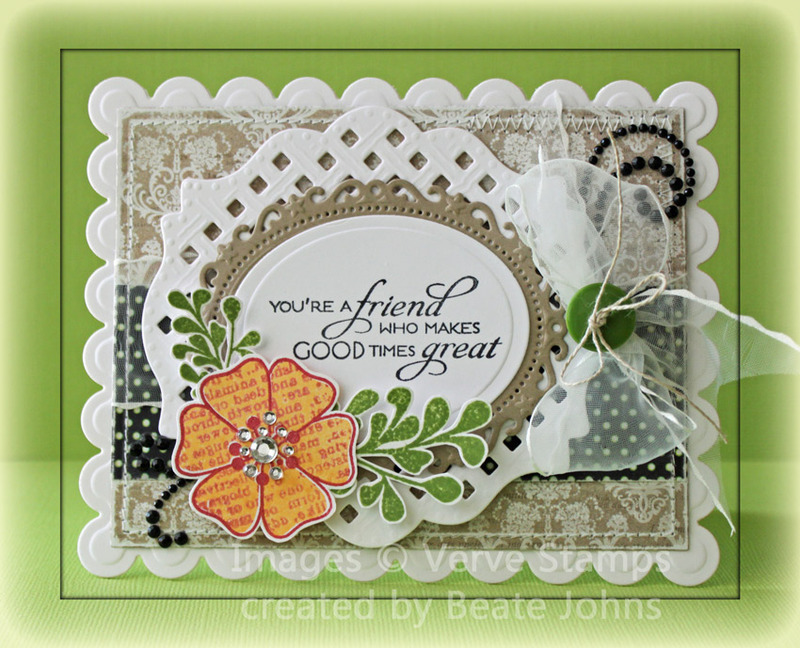 The layers were taped to the card base, white cardstock cut and embossed with a Grand Scallop Rectangle die. Parts of a black Finesse Rhinestone and Sleek Strips Silver Rhinestones and Silver Baby Bling Rhinestones finish off the card. Beate, this is gorgeous! Can’t recall the last time I have done this technique! Such a beautiful card Beate! Thank you for the video, now I understand what “kissing” is! I love this technique….beautiful card…off to play! Thanks for the tutorial. I’ve never tried this before. Your card is beautiful! Very pretty card! I like the color combinatino you used for the flower! you are a master with pattern and textures, Beate! this is so pretty! love it! I love visiting your blog and studying your cards. They are always so beautiful! I admire the way you layer the elements and the color choices you use. Thank you for the great tutorial!!! 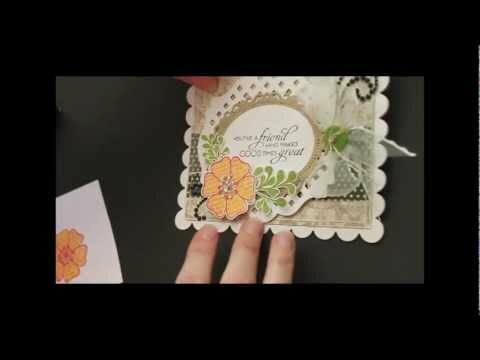 So pretty, love the lattice look behind the sentiment, I still haven’t done this technique, I need to look through my stamps and see if I have any solid stamps that would work for this! As always thanks for tips and your video’s!